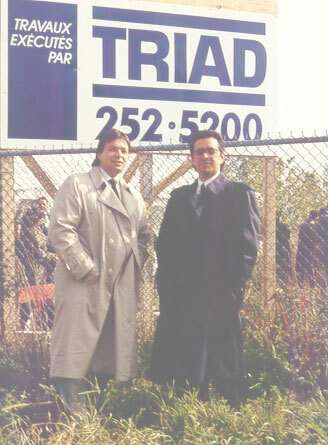 Founded in 1988, Construction Triad-APG Inc. is a general contractor and construction management company operating throughout Quebec and parts of Ontario, specializing in the turnkey and design-build construction of industrial, institutional, commercial and residential buildings. From the conception stage, we gain an understanding of our client’s needs in order to properly develop cost effective building solutions. This process is the driving force to our continued success; efficiently bringing a project to completion while building lasting relationships with our clients. The development of these client relationships has proven to be an effective formula for success, generating the majority of our business through countless referrals. With over 30 years of experience, we have gained invaluable expertise which we apply in all of our contracting endeavours by instilling confidence by professionally managing each aspect of every project. By using the traditional principles of quality and integrity we are able to collaborate with clients, build relationships and ultimately exceed expectations. Construction Triad-APG Inc. maintains the highest levels of professionalism and fairness among our suppliers, subcontractors, associates and customers alike. We look forward to building your next construction venture. Since its’ establishment in 1988, Construction Triad-APG Inc. has upheld an exceptional level of standard throughout the years. In an industry filled with innovation, we honour the foundation in which Construction Triad-APG Inc. was built and celebrate our progression and our future. We are composed of an enthusiastic and accomplished team, who provide expertise in a multifaceted construction environment. As a new generation and chapter emerge, we look forward to continuing this journey as an extension of our original principals, Mr. Charlie Albano and Mr. Alfonso Puccio. We respect their tenacity, patience, quality of work, and look forward to maintaining controlled growth and a sense of tradition.